Who says you can’t teach an old dog new tricks? 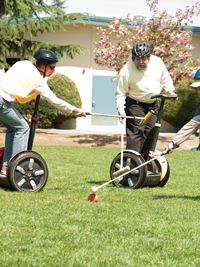 Just look at the Oakland Junkyard Dogs, a scrappy team that plays polo on Segways. Instead of horses, these guys ride personal mobility assistance devices, those futuristic machines usually seen traveling in pods at popular tourist sites.Think expensive stand-up scooters (priced up to $5,000)—without the gas. These vehicles run on an electric motor with gyroscopes and computer boards. You lean forward to go forward, and back to go backwards. They turn on a dime at a top speed of about 13 mph. It’s a phenomenon of man and metal melded into a lean, mean fighting machine. “It’s the first of the future death sports,” laughs Steve Steinberg, co-owner of Segway of Oakland. Played like polo in four eight-minute segments called chukkers, the game is won by the team with the most goals at the end. But getting those goals isn’t so easy, as I can attest. On a recent Sunday, I was asked to fill in for a no-show on the opposing team, the Silicon Valley Aftershocks. With mallets and metal flying across the field, it was all I could do to stay upright and out of the way. There’s no doubt Wozniak is one of the driving forces behind the game. His Silicon Valley team, the Aftershocks, is hosting this year’s Woz Challenge Cup, slated for July 20–22 in the Bay Area. Last year’s inaugural tournament was held in New Zealand, and teams from around the world came to play. Even China has a team, started by action star Jackie Chan. Oakland has its own celebrity in Victor Miller. In his mid-60s and the oldest player on the Dogs, Miller wrote the screenplay (or should I say SCREAM play) for Friday the 13th. When he played goalie, his team wanted to buy him a hockey mask like the one his character, Jason, wore during his killing spree. Not surprisingly, Miller switched positions.